More than any other part of your home, your front garden is a sign to the world about who you are and what you’re like. Even more importantly, it’s the first thing you see after a long day at work, welcoming you back home. This means making it right for you, your lifestyle and your neighbourhood is essential. Here are some key things to think about when planning your front garden. An immaculately manicured lawn and sparkling water feature might look good on paper, but they take time, money and a lot of effort to get right. An unrealistic design in the first stages of your front garden planning will result in a garden that’s unkempt, untidy and unpleasant to look at. 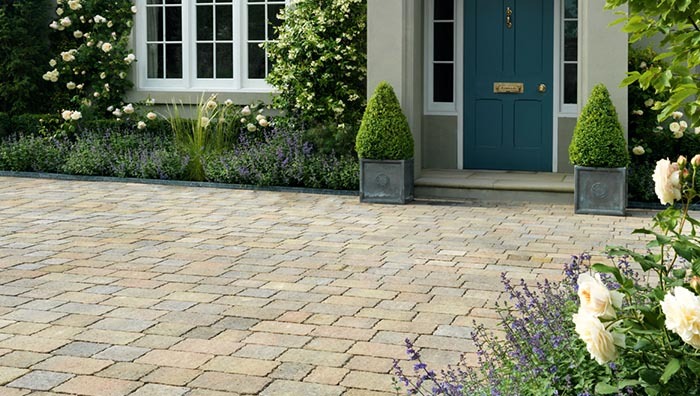 Instead, speak to a garden designer about a manageable design that you’ll have time to maintain – whether that’s regularly pressure-washing your driveway or spending a couple of hours on your planting each week. You might dream up the most beautiful flowerbeds for your front garden, but if there’s nowhere to store the kids’ bikes you’ll be in trouble. Practical storage – of everything from wheelie bins to multiple cars – will improve your design and avoid unnecessary frustrations. Take time to work out your requirements; for example, if you regularly have family to stay, it’s worth expanding the driveway area to accommodate two cars. 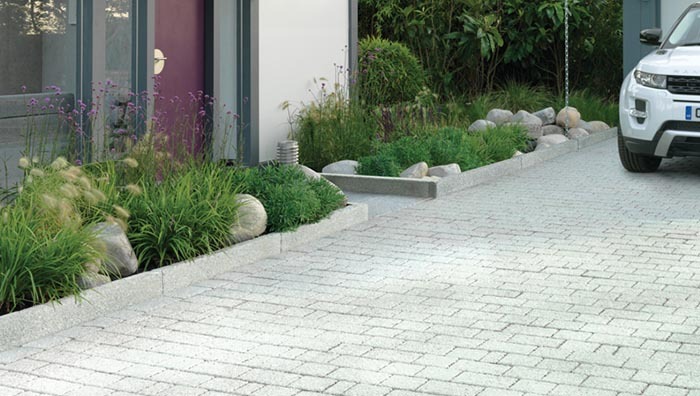 While you might need plenty of space for a multiple-car household, that shouldn’t mean you pave over the whole front garden and be done with it. It can look severe, unwelcoming, and end up being bad for the environment due to water run-off. 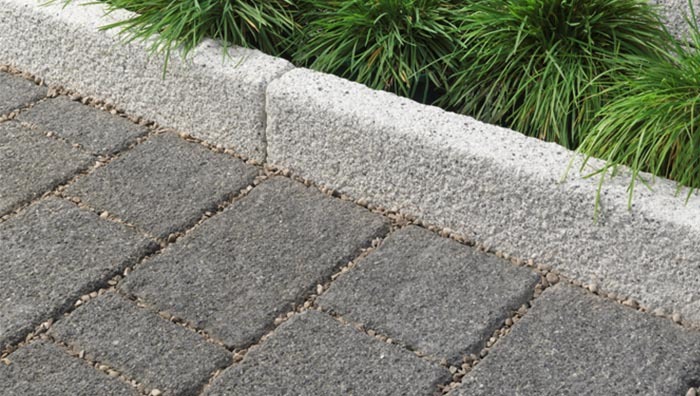 If you need a large portion to be paved, opt for environmentally-friendly materials like our contemporary Rio Permeapave. 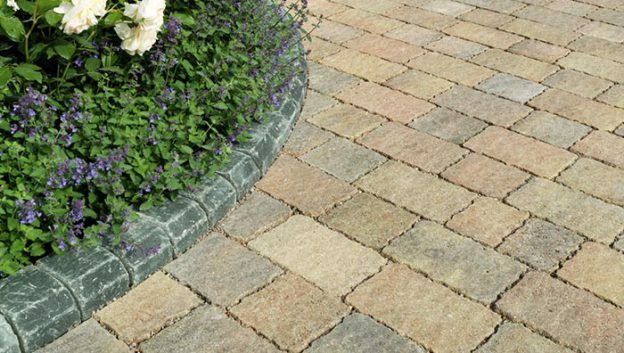 Try different colours and textures to suit your style of home – these Trident Paviors come in multiple colours and are incredibly hard-wearing. Soften the whole look by leaving space for natural, lush planting. In a small space like a front garden, it’s essential to work out where you want visitors to focus. Too much variety and no clear area of emphasis can be distracting and look messy. If your front door faces onto your front garden, choose this as the focal point, creating a clear pathway and framing the door with attractive planting. If your front door is at the side, you could install a seating area, water feature or architectural plants to give the garden a key point of interest. There’s nothing like a radically-different design to get net curtains twitching. A front garden very different from your neighbours might feel fun, but it can backfire. Individualistic designs can lower the perceived value of your house and might even incur complaints from other people. Take some time to explore the neighbourhood and see what works (and what doesn’t). Ask people what grows successfully in their front garden, and use the best bits of what you find out to design a unique but cohesive space. Our front gardens are where it’s key to find a balance between public appearance and personal interests; it’s a space to make your own, but it’s important to remember other people have to look at it too. Follow the tips above and you’ll come up with something which suits you – and your street – perfectly. For more inspiration, take a look at our other articles on designing a front garden, or connect with our network of expert garden designers to help you strike the perfect balance of form and function.